You guys are sneaky. I honestly didn’t think in a million years that Cauliflower Steaks would win the poll. It not only won, it crushed all other options! You guys really want to see a steak made of cauliflower! I guess I’m happy to oblige. For me, does this replace a wonderfully marbled and juicy medium-rare steak? Abso-freaking-lutely not. But honestly it turned out a lot better than I was expecting. The cauliflower is really filling and has a good texture. All the flavor comes from the tapenade on top. That’s the highlight of the meal for sure in my book. Thick cut slices of cauliflower make for a pretty good steak alternative for vegetarians. Especially topped with a tasty tapenade! 1) Slice cauliflower head down the center and cut off all of the leaves. Slice off four 1/2 inch “steaks” of cauliflower. If your cauliflower head is very small you might only get 2-3 steaks out of it. Make sure they are a nice thickness. 2) Some florets will fall off as you cut the steaks, reserve them and chop them. Add enough florets to this until you have 1/2 cup of chopped florets. 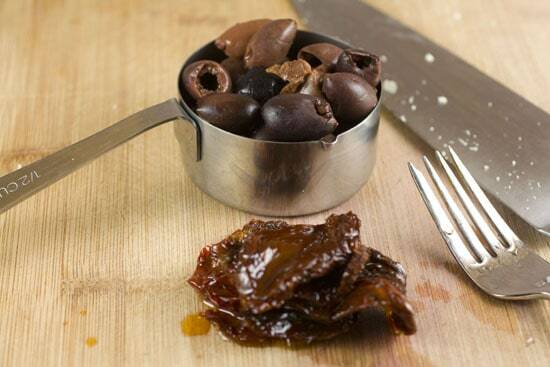 3) Dice olives and sun-dried tomatoes and mix with chopped florets. Mix in parsley, lemon juice, and a dash of olive oil. Season with salt and pepper and set aside for later. 4) To start steaks, add a good drizzle of olive oil to a large skillet and get it hot over high heat. Sear cauliflower steaks on both sides until they are nicely seared, about 3 minutes per side. You will have to work in two batches to sear all the steaks if you have 4. 5) Add steaks to a baking sheet and roast for 15 minutes at 350 degrees. Flip the steaks once halfway through roasting. 6) Meanwhile, make the tomato sauce. Heat olive oil over medium heat in a medium pot. Add garlic and cook for a minute. 7) Add in diced tomatoes and continue to cook until simmering. Season with a pinch of sugar and salt and pepper. 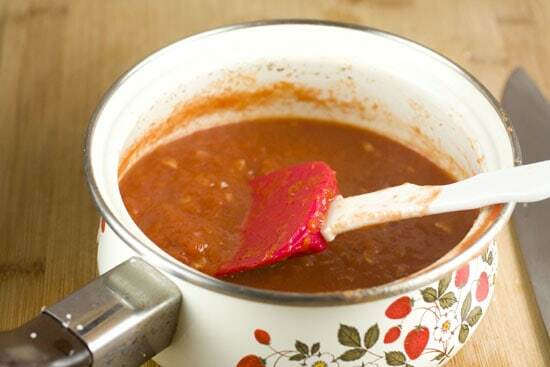 8) Pulse tomato sauce in a food processor until smooth then return to pot and keep warm until needed. 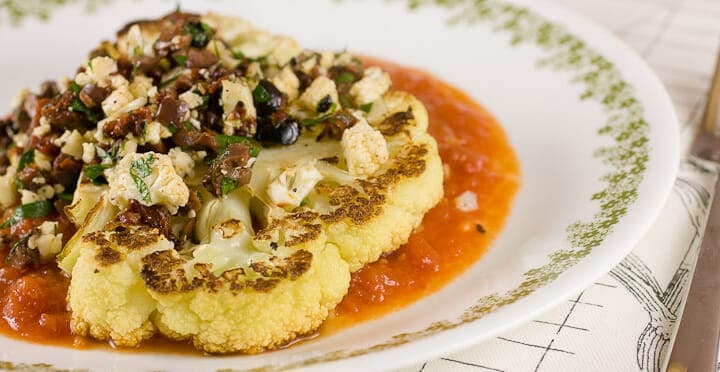 9) Cauliflower steaks are done when they are tender in the thickest stem parts. 10) Serve steaks on the tomato sauce with a drizzle of good olive oil. Top with tapenade. Adapted from Bon Appetit Jan. 2012. I’m a big fan of cauliflower actually even though I don’t make it too much for Macheesmo posts. One of my favorite ways to prep cauliflower is to roast it with some balsamic and parmesan cheese. That’s good stuff. 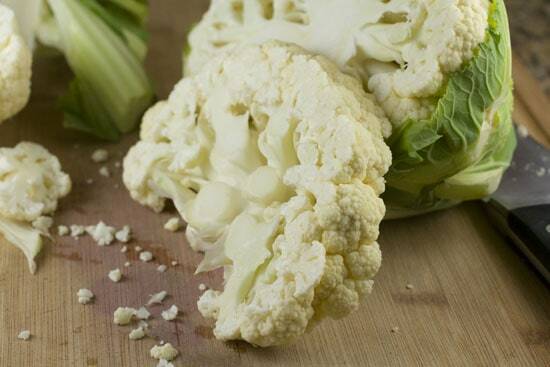 Of course, for these Cauliflower Steaks we are keeping it really simple. The key to making a steak out of cauliflower is slicing it pretty thick. If you don’t slice it thick, it’ll just fall apart. Bon Appetit says to slice it at least 1/2 inch thick, but I would maybe lean even more to 3/4-1 inch thick. You have to flip this thing a few times and you want it to stay in one nice piece. You should be able to get 2-4 steaks per head of cauliflower depending on how big your hunk of cauliflower is. One this is for sure though, as you cut the steaks, you’ll produce lots of what I call cauliflower schrapnel. You’re going to want about 1/2 cup of this schrapnel for the tapenade later so if you don’t have that much just chop up a few florets to make more. Like I said, I thought the best thing about this dish was the tapenade. Even Betsy said it was okay and she despises olives. In fact, you could just make the tapenade and put it on crostini or something and that would be a very delicious appetizer. To make it, just dice up everything pretty finely and stir it together. If you can, make this first so it sits together for a few minutes. The flavors need a chance to mingle. Season the tapenade with salt and pepper but be careful with the salt. The olives and sun-dried tomatoes are already a bit salty so you won’t need much. This is really tasty actually. The original recipe calls for real tomatoes, but I’m just never really all that impressed with December tomatoes so I just used a can of diced tomatoes to make my version. This sauce is about as easy as sauce gets. 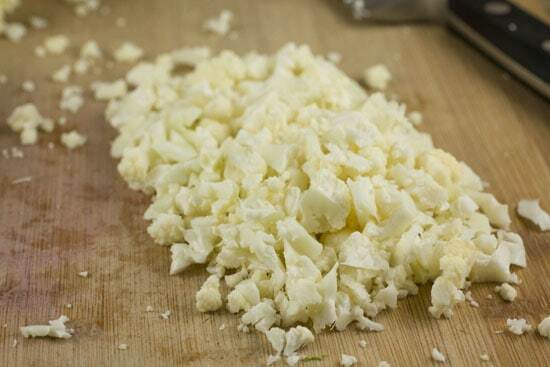 Just dice up a few cloves of garlic and toss them in a pot with a drizzle of olive oil. Cook them on medium heat until they are soft (about 2 minutes), then add in the tomatoes and bring to a simmer. I went ahead and blended mine up so it was smooth. You could leave it chunky though or use tomato sauce instead of diced tomatoes and you would be all set. Season the sauce with a pinch of sugar and salt and pepper. If you wanted to get crazy you could add in some dried marjoram which goes really well with cauliflower. Totally optional though. About as simple as sauce can get. 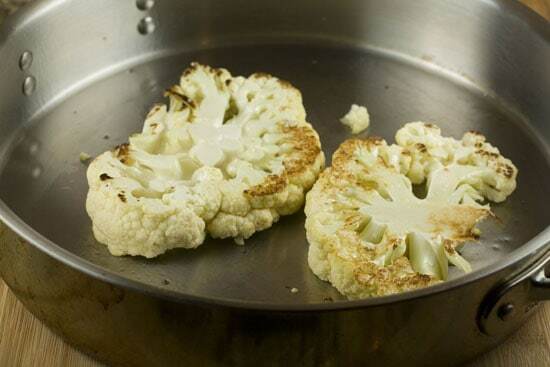 I must say, cooking these cauliflower steaks is a lot easier than real steaks. For one, they are cheap. So if you mess up at least you aren’t out $20. Second, while you can technically overcook them, it’s a lot more difficult. There’s a pretty wide range of acceptable finished temperatures for these guys. Not true (in my opinion) for real steaks. To start cooking them, add a few tablespoons of olive oil to a large pan and get it hot over high heat. Once it’s hot, add in the cauliflower steaks. I followed Bon Appetit’s advice and didn’t season my cauliflower at all. I just tossed them in the pan. If I were to make these guys again (possible) then I think I might spice up the steaks a bit with some cumin or marjoram or just some salt and pepper. If you do add something, go light on it. The tapenade has a lot of flavor. Sear the steaks for about 3 minutes per side on blazing high heat. This creates a nice sear on them. Nice crust on that steak. Then transfer the steaks to a 350 degree oven for about 18 minutes to finish cooking. Take them out and flip them once about half way through just to make sure they are cooking evenly. If your pan isn’t oven-safe that you seared them in, you can transfer them to a lightly oiled baking sheet and bake them on that. 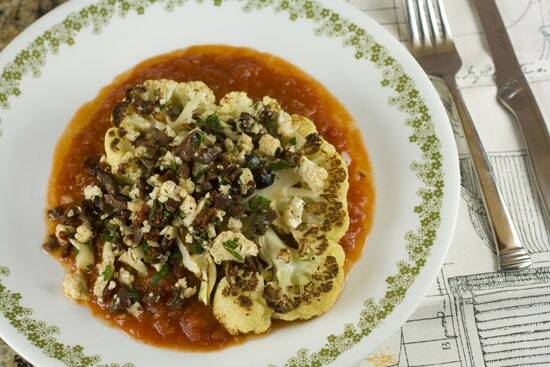 Serving is pretty straightforward: sauce, cauliflower, drizzle of olive oil, tapenade. Pile it high! I was very skeptical of how this would turn out. So was my loving wife. We were both pleasantly surprised with it though! It’s much more filling than it looks and has some good flavors. The steak on its own is kind of just a vessel for the sauce and tapenade. The cauliflower has great texture though and if you’re feeding vegetarians, it’s a fun change from the portabella steaks that they are probably most used to. It looks really good! I love cauliflower — bring us some more recipes using it! Fab idea for the cauli. I LOVE this bold, characterful vegetable. My usual trick is to lubricate it with some good oil, scatter some pink salt and dust it with garam masala before giving it a roasting. Next time I’ll be putting on some fine finishing touches and following with your recipe. Thank you, and thank you polsters! Arrgh, I keep meaning to make cauliflower steaks and then getting distracted and cooking something else instead. That’s it — no more dilly-dallying. It’s steak time! I am officially protesting this post. Your grill is joining me in this action. Cows on the other hand are applauding your effort. Tasty, juicy, marbled cows. AWESOME! Pinning this for later use. Vegetarian says thank you! Hi I was wondering for the tapenade, did u cook the schrapnel before hand or u just put it raw? 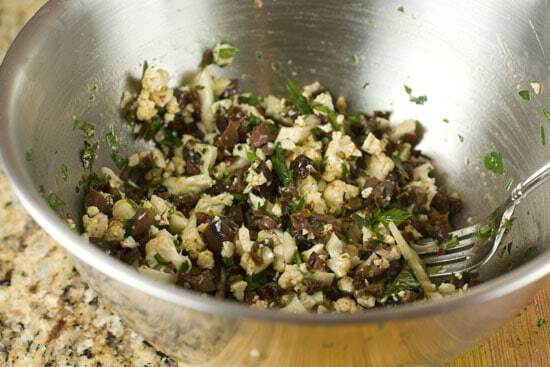 For the tapenade the cauliflower is just raw. No need to cook it but chop it up pretty finely. Good luck! I too saw this in the magazine. Was recently give a huge cauliflower and remembered these steaks once I’d cut it in half. I grilled the steaks which gave them a savory smokiness. And in my usual fashion, I added more to the tapenade which probably took it out of the tapenade category. Love your recipe template!